Fun, decorative and perfect for Halloween parties, these Glow Skeleton Balloons feature glow in the dark dancing skeletons! 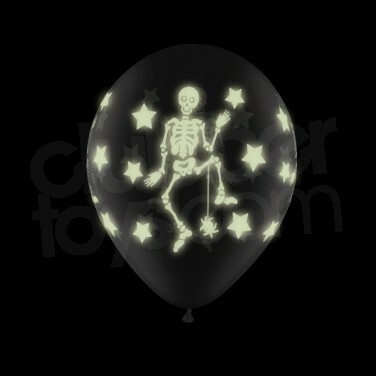 Glow Skeleton Balloons are perfect for Halloween! Turn your home into a glowing Halloween grotto with clear natural latex balloons that feature dancing skeletons that glow in the dark! Perfect atmospheric party decorations, these balloons can be inflated either by helium or air. For best effects ensure that your glow skeleton balloons have maximum exposure to UV light, UV blacklight works best, however natural sunlight also works well. Ensure that there is minimal ambient light in the room, the more ambient light, the less powerful the glow will appear. Create a floating galaxy of stars with these large transparent latex glow in the dark balloons covered in glowing stars! Neon Balloons are perfect to add some colour to your party! Add extra spook factor to your Halloween party with creepy light up ballloons! Party decorations with a difference, these brilliant LED Illoom Pirate Balloons light up for fabulous party effects! Perfect for theming parties!